Easter is only a week away but there is still time to order your chocolate treats. Lindt Bunnies aside (who can resist? ), the rest of the supermarket offerings aren’t very inspiring for lovers of proper chocolate. When I say proper, I mean chocolate with a decent cocoa content. Unless you live in London you will probably need to get on the internet and search out chocolatiers such as William Curley who offer the most tempting selection of chocolates. They are eye-wateringly expensive but totally worth it if you love good chocolate. The Sea Salt Mou is my favourite-a little bar of caramel heaven and I would happily forego an Easter egg for one –or three-of these. www.williamcurly.co.uk. 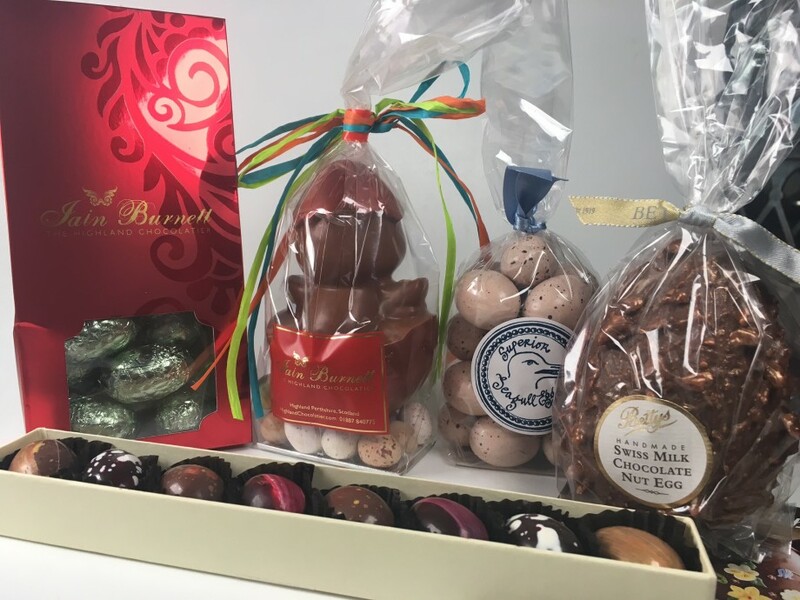 Iain Burnett, the Highland Chocolatier, has won awards for his truffles and he makes delightful little chocolate chicks for small children and for the grown-ups there are Easter eggs- ranging from mini praline eggs to glossy large eggs in white, dark, milk and ginger chocolate. www.highlandchocolatier.com. Bettys of Harrogate always pushes the boat out at Easter. Everything on their website is tempting but I particularly love the hand-painted ganache eggs and all their goodies for children are sublime- the iced Easter butter biscuits are almost too pretty to eat. www.bettys.co.uk. You can’t mention chocolate without talking about Rococo. For over 30 years Chantal Coady’s exquisite chocolates have been delighting customers. The chocolate is superb and they marry quality with quirkiness-just look at the Hand-Painted Chocolate Sardines or the Hand-Painted Chocolate Gentleman (£37.50). www.rococochocolates.com. My pick for the perfect Easter egg hunt is the packet of Salted Caramel Seagull Eggs (£10.95).